Popular blogger and author of Cozy Minimalist Home Myquillyn Smith (The Nester) helps readers find beauty in imperfection and freedom to take risks to create the home - and life - they've always wanted. This beautiful four-color book is full of photos and creative, easy ideas for arranging, decorating, and cultivating a welcoming home. Myquillyn Smith is all about embracing reality - especially when it comes to decorating a home bursting with boys, pets, and all the unpredictable messes of life. In The Nesting Place, Myquillyn shares the secrets of decorating for real people - and it has nothing to do with creating a flawless look to wow your guests. It has everything to do with embracing the natural imperfection and chaos of daily living. Drawing on her years of experience creating beauty in her 13 different homes, Myquillyn will show you how to think differently about the true purpose of your home and simply and creatively tailor it to reflect you and your unique style - without breaking the bank or stressing over comparisons. 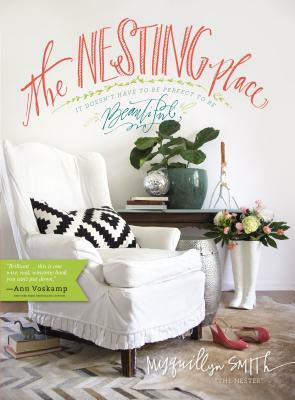 Full of easy tips, simple steps, and practical advice, The Nesting Place will give you the courage to take risks with your home and transform it into a place that's inviting and warm for family and friends. There is beauty in the lived-in and loved-on and just-about-used-up, Myquillyn says, and welcoming that imperfection wholeheartedly just might be the most freeing thing you'll ever do.